Just wanted to let you know I am really pleased with me Chilli Orange Corsa, thanks for all your help with it. My Step-son is also chuffed with having my old Corsa to drive around in - so its a win/win! Will definitely recommend Bourne End Motors to other people! When looking for a replacement Vectra we first looked at the BEMC website as you had been strongly recommended to us by friends who have dealing with you for some time. Lo and behold there appeared to be the very vehicle. A 58 model in immaculate condition with only 20000 on the clock. A quick phone call and we were on our way to view. Nick answered all our questions, detailed the history of the car and gave us a test drive. We bought it there and then. Nick identified a “blowing” problem in the exhaust system and said he would have it fixed. The car was then fully serviced and taxed and delivered to us by Tim at a time to suit us on a trailer in pristine condition. There were some scuff marks on the wheel trims and Nick arranged for a specialist to come to our house to smarten them up. We found this level of service to be amazing and I would suggest almost unique in these hard bitten days. Since receiving the car we have been singing the praises of BEMC to all who will listen and I hope this steers more customers your way. I'm just writing to thank you once again for your usual friendly and efficient service over the sale of the Fiesta. It's excellent value at the advertised price, and I find it a very worthy successor to the Focus which, as you recall, I also purchased from yourselves, way back in 2002. I'd be glad to recommend BEMC without hesitation to relatives, friends and neighbours if I hear that they happen to be looking for a new or second-hand car. Back in April I purchased a 1.4 turbo Vauxhall Astra in black from you. I just thought I would drop you a line to say how much, five months on, I am enjoying the car. I want to say your friendly and sincere approach to selling was very welcoming to me in the world of used car sales. I see you have another 1.4 turbo Astra in stock, I want to say its an underrated car, and the engine with the turbo gives great performance. Good luck in future buisness, I may be back sometime to look at another car. I wanted to let you know how very pleased my wife, Shirley, and I were with the way you dealt with all aspects the sale of our new Focus, we weren't at all subjected to the 'hard sell' techniques that one often hears about, and yet you could not have been more helpful to us, both during and after our decision to buy the car from you. The car itself is beautifully prepared and presented - it isn't new, but it looks and feels like it - we hope to enjoy it for many years. Nick, it was a pleasure to deal with you personally and with Bourne End Motor Company as a whole. Just want to say a huge, huge thank you to everyone. I love my new Astra and have made the right choice in buying. No one was ever pushy and answered all my questions I had, unlike other garages. Would recommend to all friends and family. Also thank you Tom for spending your time peeling the stickers off! I am really thrilled with my corsa - even more so than I thought I would be. It was a pleasure to deal with Bourne End Motor Co and I really feel I have just the right car - thank you to both you and Andy for all your help and patience. I really couldn't recommend you all highly enough and will certainly get my mother to bring her car in for you to look at in the near future. What a difference it makes to deal with a family business. I would just like to say thank you to everyone at Bourne End Motor Company. You took the time to explain everything so clearly to me and had the patience to go through all the different things the car did and explained it in great detail in an easy to follow manner. It made a pleasant change to deal with a company who obviously take customer service seriously. Even though I had to travel a long way to collect the car I am delighted with it and can only say that it was well worth the drive as the car was exactly as described and looks virtually brand new. Keep up the good work and I am only too happy to recommend you to other's. I Just wanted to say how appreciative I am of you and your staffs courtesy and attention. Having visited my two local Ford Dealers a friend suggested I try you, what a blessing. You listened to my requirements and within two weeks I was driving my new Ford Fiesta and to cap it all, your price was substantially cheaper then the two Ford garages. I will certainly be recommending you and your company to all my friends. Just picked up my Vauxhall Zafira. Very pleased with it. I would thoroughly recommend Bourne End Motor Company. The service is second to none. John Thorne in particular is a credit to the company. Nothing was too much effort. He explained everything about the vehicle clearly and concisely. Also the pricing was very good. In fact I did a lot of research on the net and couldn't beat it. I would just like to thank you and your colleagues for organising a great deal and a smooth delivery of my wife's new car. As you know we had originally agreed to purchase a Renault Grand Scenic, however once we test drove your Zafira I am happy to say that we were hooked and from that point on there was only one vehicle for us. I will definitely give you a call when I replace my car and I have already recommended you to friends etc. A quick email thanking you and all at Bourne End Motor Co in making the purchasing of the Zafira SRi such a smooth way to deal. 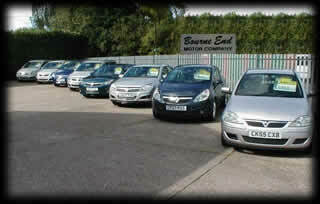 I have bought a lot of cars in my time and I will definitely consider your company as 1st choice for all future changes. I had a great drive back to Dorset, in actual fact I didn't want the journey to end - that's how happy I am. Too often in life people always manage to find time to complain about anything and everything. I deal with the public everyday and it never ceases to amaze me what lengths people go to to take advantage of a situation and gain the upper hand. Good service and indeed a good product are an expectation these days and are very much taken for granted and very rarely recognised or acknowledged. Therefore I would like to apologise to you for not recognising your excellent service and your equally excellent product. Having taken delivery of our Meriva in Nov 2006 at our home in Plymouth my partner Lisa and I were amazed at the personal and professional service we received by you and were equally impressed with the car. Needless to say we are very pleased with the Meriva and I felt it only right to take time to e-mail you and your team with our heart felt thanks. I would also like to thank you for the Xmas card and would like to wish you well in 2007. If we ever decide to update our car in the future, your website will be first on our list. I would just say a big thank you for your help and guidance in locating me my Vauxhall Astra Sri Diesel. Only having had the car 3 weeks I have already had over 1000 miles of fun in the vehicle. It is so refreshing to find someone within the motor industry you could put your faith and trust into and know that they would find you the perfect car at a price that no Vauxhall dealership could match. I wasted so much time trying to locate a car that would have been acceptable, but had I visited you earlier I would have found the right vehicle within days. I would have no hesitation in recommending Bourne End Motor Company to my friends and family when buying a used vehicle. Having spent 2 months searching the internet and visiting several showrooms for a 'nearly new' Vauxhall Zafira I discovered 'Bourne End Motor Company' through Exchange and Mart. I browsed their web pages and found one that I liked the sound of. To be honest it was the price that enticed me to travel 70 miles across London to pay them a visit. I entered the show room and had a good look around the cars on display before Nick introduced himself. It was a nice change not to be jumped on as soon as you entered a showroom. I explained what I was looking for and Nick gave me a full list of cars that he had in stock, and said he would be more than willing to find one in the spec I wanted. As it turned out he had one in stock with a better spec than I wanted for a thousand pounds less than the local Vauxhall dealer. When I rang the Vauxhall dealer to see if he could match the spec/price...they said they could not get anywhere near the price. 2 weeks later I picked up the car from Nick which had been fully served, cleaned, taxed, AA cover and ready to drive away. I would thoroughly recommend a visit to 'Bourne End Motor Company' for their great service and competitively priced cars. I am just writing to say a big thank you for helping me through my first car buying experience! As you know, my husband died in March and I had to find a car that would be suitable for me for the next few years. I did a lot of research and spent many hours on the web looking for the best deals. I came across you by chance and I'm really pleased I did! I have had a pretty tough time since my husband died, struggling with solicitors, accountants, banks, his business and also coming to terms with his loss. You have been really helpful, patient and understanding. I'm delighted with the car and also the level of service you gave. I have told friends about you and no doubt in time you will get other business through me. I'd also like to thank Tim and Chris for being so efficient! I'd just like to say a huge thank you to you and your staff at the Bourne End Motor Company. We are absolutley thrilled with our Zafira Elegance, as far as we are concerned it's a 'new' car. The condition is immaculate and it drives superbly. Despite not having the exact car we required in stock, you were able to source the vehicle for us in a matter of days. We were very happy to put ourselves in your hands and rely on your expert advice - and we are so glad we did! The combination of price and excellent customer service you provide is unbeatable. I never knew buying a car could be such a pleasurable and stress free experience. We will certainly be recommending you to all our friends! In an industry full of rogues and wide boys, Nigel, Tim & Nick are indeed Roses amongst the thorns. At 10.22 on Wednesday I emailed Bourne End Motor Company asking them to source a Zafira GSi in Arden Blue with a long list of extras and a budget I could afford. Within 30 minutes I received a call from Nigel informing me they had found a car with even more extras and lower miles than expected for less than my budget! In fact they kept finding extras on the car. I bought the car a week ago and am still in shock, it's wonderful. The service I received was without doubt the best ever from any retail outlet I have ever visited. Thank you all so very very much. Just a quick note to thank you for the polite and courteous service shown during our recent car purchase from yourselves. Nikki loves the car. She still looks out at her car in the morning with a big smile on her face. The Mini is absolutely brilliant and I am thrilled to bits with it. Thank you all for keeping in touch with me, especially through the difficult stage of me getting my hands on the cash. You have been very honest, professional and very fair. It is very refreshing to find a motor company that treats women like this, believe me. You can be assured that I will recommend you to my family, friends and colleagues. If I am out your way I will pop in and say hello. I cannot thank you enough for how smoothly this went through. We would just like to say a big thank you to you Nigel for your excellent service. After looking for a long time for a diesel SXi Astra I came across your web site via the auto trader. Your web site is easy to use and concise, the photos are clear. We telephoned to enquire and as soon as we spoke to you it really came across that you offered a friendly and very helpful service. But was it worth travelling from West Wales to make a deal? YES !! Every mile! The car was as you said Nigel we are very happy and we will be sure to contact you again when we decide to have a change of car again. Once again Thank you to all keep up the great service. This letter is 4 months and 2,026 miles overdue - apologies for the delay. I could say it's because I am so in love with my car that I haven't been out of it since I left your forecourt - but that would be something of an exaggeration. However, I did just want to thank you for all your patience and tolerance with my questions and queries before my purchase. I have to say the step up from a Peugeot 106 to a Golf 1.6 SE is akin to going from the Third Division to the Premier League in one match. Power steering and four doors just for starters, not to mention central locking, large boot, great power and wicked stereo. The only thing I haven't figured out is how on EARTH do you lock the glove compartment?? Answer by email please! Many many thanks to both you and Tim and I will be back in three years for the sway to the next one. "I would like to thank yourself, and all the other staff I dealt with at Bourne End Motor Company, for the efficient and courteous service I received during the recent purchase of BMW Convertible. From the ease of use of the web-site to the prompt response to my telephone enquiries to the efficient manner in which the car was registered and 'plated', the process could not have been handled more efficiently. I would have no hesitation in recommending your Company to others. The car itself has also surpassed all my expectations and is fantastic." "Just a quick note to say thanks for making the buying of my new Beetle so easy! The only thing I'm finding tricky is keeping the flowers alive in the vase. What an amazing car. Thanks again." "Just a quick line to thank you for your kind and gracious 'after-sales' service. Never once did you make me feel that I was a nuisance and it was all sorted out with efficiency. So far the car has continued to run well! Anyway courtesy is a very rare thing nowadays, so I thought I would acknowledge it when I saw it. Thanks!" "Once again many thanks for all your help in setting up the deal on the Porsche Boxster. Its fantastic, we are absolutely delighted." "Many thanks for all the help with my Honda. I absolutely love it to bits. Thank you for making the whole process so easy for me. Please pass on my thanks to the rest of the team." "Please accept our sincere thanks for looking after the purchase of our daughter, Caroline's, car. You truly 'delighted and astounded' your customer." "I would just like to thank you for assisting us with the new Focus Ghia that we purchased last week. Having the salesman back in a car, all within two days of order, was very much appreciated. I would have no hesitation recommending your company."